I sing that song every time I have a head making day...loudly and with gusto...and sometimes in funny voices...just ask my family. And this lovely lady is another Crow Girl. She is waiting for a hat and tells me DAILY that this bow looks stupid stuck on her head. It will eventually go on a hat I tell her, but she doesn't seem to believe me. Note the look of stark disbelief on her face. And that's what's happening here in the Nest, what's going on in your neck of the woods? 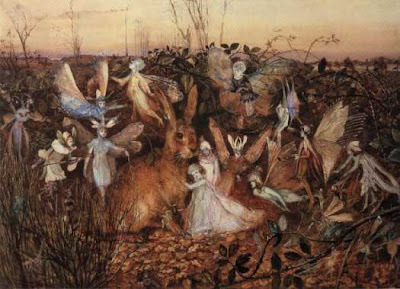 Happy Eostara or Spring Equinox! I can feel it in the air these days, Spring is creeping her way out in fits and starts. A flash of pastel blossom skirt, a bit of perfume that lingers on the breeze, an ephemeral touch of warmth on your cheek, she's making her way here like a flirty young girl into a crowded dance room. I'm so impatient to see her dance! In case you were unaware, the the holiday name ‘Easter’ was taken from the name of a Teutonic lunar Goddess, Eostre ..from whom we also get the name of the female hormone, estrogen...what fun! Her chief symbols were the bunny (both for fertility and because her worshipers saw a hare in the full moon) and the egg (symbolic of the cosmic egg of creation). So in the spirit of Eostara and that shy girl, Spring, I give you some more bunny pictures and a little spring pixie...Enjoy! This brown one's name is Jack. He's divinely soft, made from a felted camel's wool sweater...nummy! And this is Isabella with her little dolly. They love to have tea parties. And Milly reading a favorite book about Easter bunnies, a job she aspires to when she grows up. Can you tell I'm having too much fun playing with dolls these days? I was looking around the shop and noticed that there seemed to be a lot of bunnies in there these days ...well you know what they say about breeding like rabbits...and I'm actually making a few more! So I've decided to have a sale. 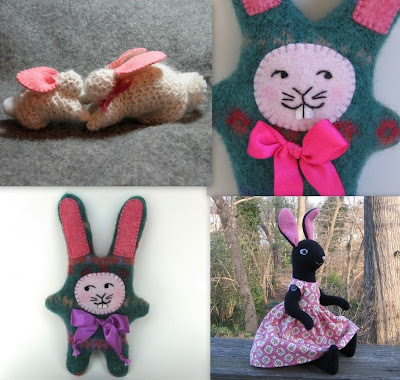 From today through April 12th all bunnies in the shop will receive FREE SHIPPING....and just for my readers, if you put the words "march hares" in your message to buyer section, I'll give you another 5% off (I'll refund you the amount through paypal). But if you want them for Easter please purchase before April 5th so I can get them to you in time...sooner for my friends outside the U.S. Happy rabbits to all of you! Here in the South a snowfall is such a rarity that when it does occur something marvelous happens. Not only do schools and businesses close, but there is an incredible air of holiday everywhere you go. Kids and adults are all outside throwing snowballs, packing white mounds into forts and snowmen, lying on their backs windmilling arms and legs into snow angels, gulping steaming vats of hot chocolate, and gleefully shrieking as they careen down icy hills on anything that could remotely be used as a sled. It is such a lovely thing to see and possible only because we all know how ephemeral this chance to play will be. Everybody should take the chance to play like a kid from time to time so even if snow is not such a big deal where you live, take the time for a little play...it's exactly what you need!